Home » Our Doctors » William Burns O.D. Drs. Truitt & Truitt Inc. is happy to announce the addition of Dr. Will Burns to our staff. Dr. Burns joins Dr. Tom Truitt, Dr. Susan Truitt, Dr. Shannon Davidson, and Dr. Matthew Thompson in caring for our patients. 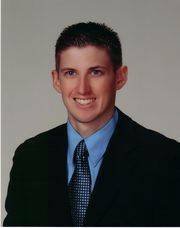 Dr. Burns is a 2013 graduate from The Ohio State College of Optometry where he graduated with honors and was a member of the Beta Sigma Kappa Honor Society. Dr. Burns is presently completing a residency at the Chillicothe and Columbus Veterans Affairs Medical Centers, where he is focusing on the detection and management of ocular diseases. Dr. Burns and his wife Ashley (Coder) Burns grew up in Marysville and graduated from Marysville High School in 2005. In his free time Dr. Will enjoys spending time with his family including his dog CJ as well as participating in and watching sports. Dr. Burns is currently accepting new patients and is looking forward to providing along with all our doctors the highest quality eye care to Marysville and the surrounding areas.